Over 200 endangered Hutton’s shearwaters (Puffinus huttoni) fledglings downed by bright lights were rescued from roads in and around Kaikoura on New Zealand’s South Island during the 2014/15 breeding season. Following collection by volunteers the young birds were measured, weighed, banded and released to sea by the Hutton’s Shearwater Charitable Trust and Albatross Encounter. When the fledglings depart their only two remaining mountain colonies in the Seaward Kaikoura Range inland of Kaikoura and head towards the ocean, they unfortunately become attracted and disorientated by the town’s street lights. Mitigation measures are currently underway. The Department of Conservation is to provide a grant of $45,000 over three years to support the Hutton’s Shearwater Charitable Trust in appointing a Project Coordinator. 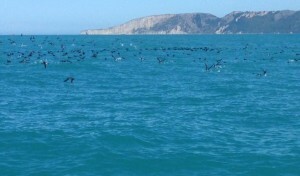 In 2002, an estimate of the population of Hutton’s shearwater was made by Graeme Taylor (Department of Conservation) and Paul Scofield (Canterbury Museum) using mark-recapture techniques. A team visited the Kowhai River colony where 2000 birds were spray painted red or yellow underneath. After the marking was finished, sightings were made from boats at sea or from the beach, of the ratio of coloured/non-coloured birds from which the estimates of the number of breeding birds were made. It had been 12 years since that work took place and the Trust repeated the exercise again in September 2014. Four boats were used on the water, each with two teams consisting of an observer and a recorder. Each team made observations from a different side of the boat, to ensure birds were not counted twice as the boat moved slowly through the rafts of shearwaters sitting on the water. The count involved counting the number of birds sighted with red paint and the number of birds without paint. 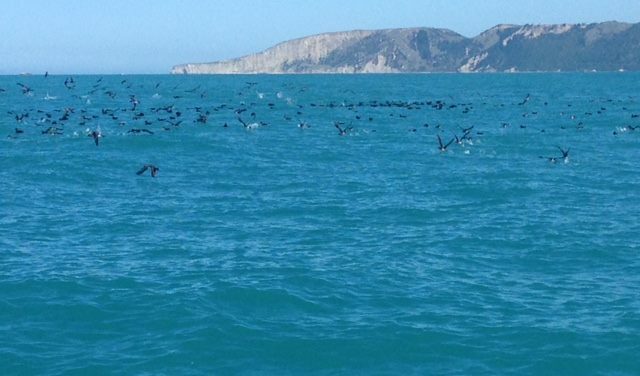 Kaikoura’s first full weekend dedicated to seabirds and the science behind them has been hailed as a great success. 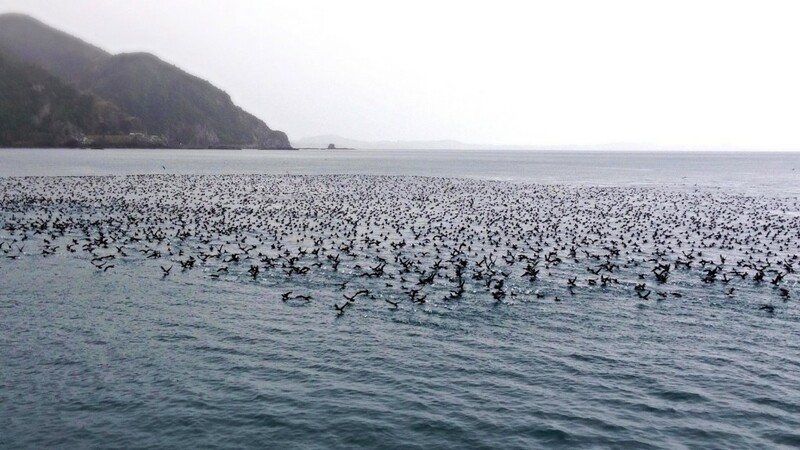 Here is a photo taken on yesterdays Whale Watch Kaikoura tour, with hundreds of Hutton’s shearwaters rafted up at sea, patiently waiting for the snow to melt in their alpine colonies. Photo: Jaegan Taylor, Whale Watch Kaikoura. Fewer than half of the expected 100 endangered hutton’s shearwater chicks were plucked from their nests and relocated to the man-made colony on the Kaikoura Peninsula due to the late breeding season. ‘‘We want them here for a long enough period of time so that we can reprogramme their GPS and make them think that this is home,’’ Mr Bell said. The annual Hutton’s shearwater translocation project starts next week and the Hutton’s Shearwater Charitable Trust is keen to give the local community plenty of opportunity to come and have a look at the work being done at the peninsula colony. Hundreds of metres above the multitude of seabirds to be found on Kaikoura’s beautiful coastlines, the Hutton’s shearwaters have the ultimate ocean view from their mountain perches. But why does a seabird choose to breed high up in the mountains?